Delish.com (to be launched in the Fall) is a partnership between Hearst Magazines and MSN today. Their July 8 press release stated that "MSN and Hearst anticipate that Delish’s traffic numbers will immediately place the site into the top 10 food-related destinations online." In this interview, Chuck Cordray, vice president and general manager of Hearst Magazines Digital Media, talks about what will set Delish apart from the other food sites already available and why he thinks it has what it takes to immediately be a top food site. Can you give us a brief overview of Hearst Digital Media and your role there? Hearst Digital Media, with the launch of Delish, will be at twenty-four sites and those are a combination of sites related to our magazines Goodhousekeeping.com, Redbookmag.com, etc. as well as pure digital sites that we have launched or acquired like Thedailygreen.com, Realage.com, and Kaboodle.com. Our total is twenty-five milion uniques a month. P&L, sales, and content engineering report in to me. How did the idea of Delish.com come about? I think it was an opportunity for both MSN and for Hearst. Each party obviously brings something different to this. Hearst has a long heritage through our magazine brands with food, recipes, and entertaining content. As we looked at the experiences online, we thought there was an opportunity to create a brand online that is a little bit different - to use the latest technology to make a really interactive experience for home cooks. Home cooks have a whole range of interests that they are trying to serve – some nights it’s, “I want to get something on the table in 30 minutes,” and other nights it’s a very different experience of a dinner party where you want to really impress everybody. It’s different needs at different times – different interests from, “OK, this is my healthy meal,” or, “This is my indulgent meal.” We wanted to make it really easy for people to find what they want when they want it and be part of the food community. Both in our editorial approach and our technical approach, our goal is to deliver that experience in a way that people are really loyal to the site. Most people who look for food today start in a search box. We want to get people thinking, “Wow! The best place for me to go for food and entertaining is Delish.com,” and to start with us. Over time, we want that delightful experience to bring people back. As for Hearst and MSN working together, obviously as one of the largest portals, MSN has huge reach. Their ability to distribute this content out to a massive portion of the online audience was a great pairing with our content capabilities and our abilities to design user experiences. So, it was natural evolution of the deals that we had already together for content syndication that has continued to expand. What can we expect the format of the site to be like? There are certain things that are basic, that you have to have if you want to be a food site. Obviously, we will have a significant base of recipes from both Hearst and from other parties – partners that will be syndicating content into Delish. The basics we have covered, and then to that we are adding in very significant customizations and community functions. On top of a really solid base of user generated recipes and our edited recipes, the recipe finder has new and innovative meal planners, interactive shopping lists, and event planners, all built into it, making it really easy for people to filter back and forth from one to the other. They are integrated in a very user friendly way. We’ve really worked hard on our recipe tools to make them intuitive and to build in community. We are also focusing the content in somewhat different ways. There is a lot of focus on the fun and entertaining aspects of food; for example, firehouse food. We are going to do “Hunky Firemen – What do they do to feed the firehouse?” It’s fun. It’s interesting. We really want people to participate as part of the community - sharing with friends (either real world friends or people you meet online). There is a huge community around food and we think there is a real opportunity to use technology to enable that in new ways. Rewarding people who participate in the food community will be a central part of what Delish is all about. In what ways will people be able to build community on Delish? Are you referring to discussion forums and commenting on recipes? All of the above and more. We will allow people to version our recipes. For example, in a Good Housekeeping recipe you say, “I like this, but I like nutmeg instead of cinnamon.” Then, great, create a version and make that version available to the community. Share your version with some people or share it with everybody. We think those sorts of easy interactions are critical to really making the site differentiated and why people will want to come back to it. Will there be a print version of Delish? This is strictly online. Obviously, we hope the brand will grow dramatically and who knows where it will go. Where we are starting, it is a online property for the foreseeable future. Your press release states that you expect Delish to be one of the top ten online food sites at the time of the launch. How will this happen? Well, this comes back to the power of MSN’s distribution as one of the largest portals. Food is now part of a lifestyles channel within MSN. To get to food within MSN, you first go to lifestyles and then find recipes as a part of that. With the launch of Delish, food and entertaining will be its own channel and obviously that will then receive significant promotion from the Hearst side and then, obviously, significant promotion from MSN. Given the distribution power of MSN, we anticipate that we will launch as a top ten site. We do have our expectations of who the property will attract, but I think in many ways, part of the key is the mindset of the user. We expect it to be more female than male, but we don’t want it to be exclusionary. The site is for, frankly, a wide range of cooks and cooking interests. Part of what we are trying to do in terms of design and reach in content is to make it easy for people to find the things that they need about a food experience, so theoretically our audience is anyone who is interested in cooking at home. There will be restaurant recipes as well, and the fun elements of food and entertaining will also be part of the mix - interesting facts about food, great restaurants, and celebrity chefs. Whether it’s part of the recipe you are going to cook tonight or not, it is part of the food experience and part of the interest that we will serve with Delish. What have you enjoyed about working on Delish? For me, the fun is in designing a user experience that sort of surprises and delights people. If we can anticipate what people need next and give them that better service of: I’m cooking with buttermilk. The recipe calls for buttermilk. I only need half a cup in the recipe. Here are five other buttermilk recipes to use the rest of that quart you had to buy. That kind of useful advice that helps people in their daily lives is fun – trying to figure out how we do that in an easy way so that it’s not overwhelming. It’s easy to overwhelm people with too much information so how do we do it from a design and technology standpoint so people feel like there is an endless depth, but not problems in terms of accessing that depth. What has your biggest challenge been in developing Delish? The biggest challenge is always doing something on a timeframe. We have worked very quickly and very well with Microsoft on combining our ideas and needs on how to serve these audiences. It has worked really well, but we’ve been on a tight timeframe. It’s probably a six month timeframe for the majority of the real site work. For a site that will be a top ten food site, that’s fast. What is the size of the staff on Delish? We’ve had different people from Hearst Digital Media working on this, so we’ve drawn from existing staff and then also we are bringing in new staff devoted specially to Delish. As a private company we have the luxury of not revealing financials and statistics on staff, so we just don’t do that. But, what we have done is use some of the existing Hearst Digital Media staff from the other twenty-three sites to fill in as we staffed up for Delish. Are you talking about hundreds of people? No, no, no. More in tens than hundreds and much closer to ten than a hundred. Part of that also is because we have a base of infrastructure at Hearst Digital. There are obviously basics that we can reuse, so we can scale more quickly because we already have an existing infrastructure. Who will be writing for Delish? That’s something that we are not comfortable saying yet. As we get closer, we’ll be doing more unveils about people who are participating. Some are already signed up and some are already in negotiation. But, we do plan to have a great deal of contributors beyond the Hearst and Microsoft contingents. There will be significant outside contributions to the site. I am kind of a foodie. It depends on how you want to define foodie. I love to cook. I am not an esoteric, gourmet cook, but I really like food and I like the cooking experience. I like trying new things, so this has been a fun project for me. I have such a range of interests in food because I like a little bit of all of it. I think I’d have to go with Julia Child. I’m sure that’s the safe answer. But, she did so much for how America thinks about food and I love the fact that she really didn’t cook until I think 40. She was in her late 30s or early 40s when she decided, “This is something I want to learn about.” She just explored it and made it work for her - made it work for the country in a way nobody else had to that date. She was pretty amazing. In a lot of ways, she really started it all. I’m sure some people would disagree with that, but it’s kind of amazing to me what she did – from I don’t know about this and I want to learn, to let me help everybody. People think she did it forever - of course, she was the authority. No she wasn’t. She just started teaching herself and started getting instruction. It’s sort of the - anybody can cook, like Ratatouille. 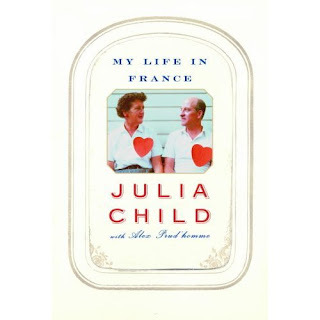 Julia Child started late in life and decided this was going to be a passion for her. I respect that. Interesting interview -- thanks Stef! I liked the section where he talks about Julia Child. Inspired me to do some research on her. Anyway, I'll be curious to see what comes of this new online property. As always Stef, thanks for giving us the inside look. Will look out for the site when launched.